Dementia with Lewy bodies (DLB) is a common neurodegenerative dementia in older people; however, the clinical features, particularly cognitive fluctuations and rapid eye movement sleep disorder, are often hard to elicit, leading to difficulty in making the diagnosis clinically. Here we examine the literature for the evidence behind imaging modalities that could assist in making the diagnosis. Dopamine transporter (DAT) imaging remains the best modality for differentiation from dementia of Alzheimer’s type with high sensitivity and specificity reported based on pathological diagnoses. 123Iodine-metaiodobenzylguanidine myocardial scintigraphy (MIBG) however is rapidly becoming an alternative imaging modality for the diagnosis of DLB, though studies assessing its accuracy with postmortem verification are still awaited. However, there are suggestions that MIBG may be better in the differentiation of vascular parkinsonism from DLB than DAT scans but may have lower sensitivity for detecting DLB compared with the 80% sensitivity seen in DAT imaging. Structural MRI scans have long been used for the diagnosis of dementia; however, their utility in DLB is limited to revealing the presence of coexisting Alzheimer’s disease. Fluorodeoxyglucose (FDG) PET is an alternative biomarker that can also differentiate Alzheimer’s disease and DLB but lacks the evidence base of both DAT and MIBG scans. Dementia with Lewy bodies (DLB) is a common form of dementia in older people characterised by Lewy bodies consisting mainly of alpha-synuclein1 within the brain at postmortem of patients who had a clinical dementia syndrome. The criteria for DLB has recently been updated2 to reflect the increasing use of biomarkers, with imaging biomarkers playing a key role (see table 1). The frequency of DLB as a proportion of all dementia in postmortem studies (at least 15%)3 4 exceeds that found in clinical prevalence studies (4%–5%),5 6 raising the suggestion that detecting the condition clinically is more difficult than other types of dementia. Indeed, a recent meta-analysis of the diagnostic accuracy of the clinical criteria to date found that about 20% of DLB diagnoses were incorrect.7 The increasing use of imaging biomarkers and their raised prominence in the diagnostic criteria aims to help clinicians bridge the gap between clinical and pathological prevalence rates. In particular, differentiation of patients with DLB from patients with Alzheimer’s dementia (AD) is often difficult for clinicians, especially as Alzheimer’s pathology can be present to varying degrees in DLB, affecting the clinical presentation and imaging findings.8 Nevertheless, differentiating DLB is important for the patient in order to increase vigilance of associated comorbidities such as autonomic dysfunction, to avoid harmful medications such as neuroleptics and to facilitate appropriate treatment of any movement disorder.9 Similarly, early identification will prevent delays in management and unnecessary investigations. Here we study the evidence behind the latest imaging techniques in DLB and their usefulness in making a DLB diagnosis. Given the difficulties in diagnosing DLB clinically, the review focusses mainly on imaging studies where the diagnoses are confirmed pathologically. A literature search was carried out 29 September 2017 using PubMed. The following results were obtained from searches in the ‘Title/Abstract’ fields using the stated terms. (Lewy) AND ((amyloid OR tau) AND PET): 110 articles. Only English language articles were considered for further review. A search of the Cochrane library carried out on 29 September 2017 using the terms: ‘dementia’ or ‘Lewy’ or ‘DLB’, revealed three potentially relevant reviews. One is discussed in this review in dopamine uptake imaging. The other two found scarce evidence for the use in the early diagnosis of DLB in persons with mild cognitive impairment of both amyloid PET imaging10 and fluorodeoxyglucose (FDG) PET,11 though both reviews were primarily focused on AD. 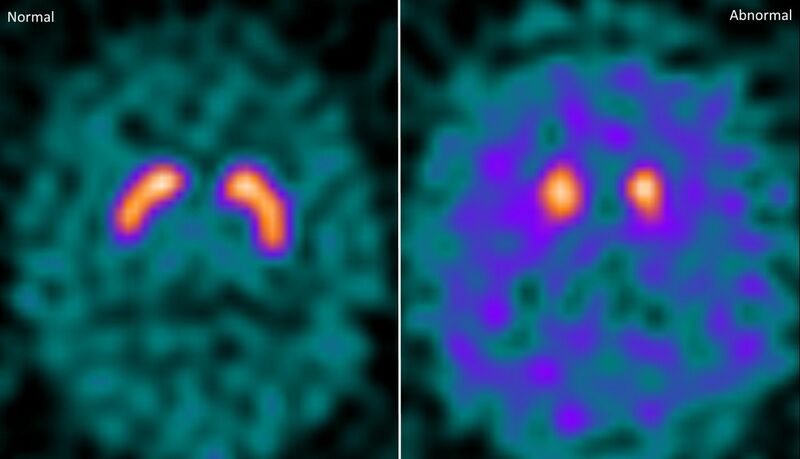 A comparison of a normal DAT scan on the left and an abnormal DAT scan on the right, with the latter showing reduced dopamine uptake in the basal ganglia. Images were provided by Sean Colloby (Newcastle University, UK). DAT, dopamine transporter. Studies have also assessed the underlying methodology. The ‘striatal binding ratio’ is used for semiquantitative analysis of DAT scans, but interobserver errors are still seen.21 Combining semiquantitative analysis with visual rating however increases sensitivity for neurodegenerative dopaminergic diseases22 including DLB23; however, these studies were based on clinical diagnoses only. A comparison of a ‘prodromal’ DLB group (defined as having rapid eye movement (REM) sleep behaviour disoder (RBD), olfactory dysfunction, autonomic dysfunction and depression and diffuse occipital hypometabolism on FDG PET), with clinically diagnosed probable DLB as well as AD patients, found both DLB groups to have lower striatal binding ratios than the AD group. In addition, the level of binding in both groups was again negatively correlated with the level of parkinsonism.24 This suggests that DAT imaging may even be able to distinguish early DLB in those presenting with mild symptoms. Hence, DAT scans are an excellent measure of an underlying dopaminergic disorder involving the striatum and, in a patient presenting clinically with a dementia syndrome, are a very good means of differentiation from pure Alzheimer’s disease, even in early disease. DLB can be associated with cardiac sympathetic denervation, contrasting with relative preservation in AD.25 The SPECT tracer MIBG allows the detection of early changes in the cardiac sympathetic nervous system non-invasively. The heart-to-mediastinum ratio (commonly referred to as the H/M ratio) of MIBG uptake (see figure 2) is reduced in DLB when compared with healthy adults and in those with AD, providing a useful means of differentiating DLB from other dementias. A meta-analysis in 2010 reviewed eight studies comprising a total of 346 patients with dementia (152 patients with DLB and 194 patients with other dementias) and revealed a pooled sensitivity in the detection of DLB of 98% and a pooled specificity in the differential diagnosis between DLB and other dementias of 94%. The area under the receiver operating characteristic (ROC) curve was a very high 0.99,26 confirming the utility of MIBG imaging in the diagnosis of DLB. More recently, however, the first large multicentre study including 61 patients with probable DLB, 26 patients with possible DLB and 46 patients with probable AD showed a much lower sensitivity (69%) and also a lower specificity (89%), though this was higher in mild dementia subjects (scoring 22 or more on the mini mental state examination)27 at 77% and 94%, respectively. However, neither the review nor the multicentre study was supported by postmortem confirmation of DLB diagnoses, raising doubts about the figures reported by each. A comparison of a normal MIBG scan on the left and an abnormal MIBG scan on the right. The heart (Roi 1/oval) to mediastinum (Roi 2/rectangle) ratio is lower in the abnormal scan, indicating a loss of sympathetic innervation. Images were provided by Joseph Kane (Newcastle University, UK), Alan Thomas (Newcastle University, UK) and Jim Lloyd (Royal Victoria Infirmary, Newcastle upon Tyne, UK). Comparison of MIBG and DAT in 30 patients with a clinical diagnosis of probable DLB and 29 patients with non-DLB dementia (13 with AD but also 16 with FTD, which can present with parkinsonism) found MIBG to have better detection rates: MIBG sensitivity of 93% and specificity of 100% and DAT scan sensitivity of 90% and specificity of 76%. Hence, MIBG may be better at detecting DLB in patients with parkinsonism.29 A comparison in just DLB and AD subjects found DAT scans to be slightly more accurate, sensitivity and specificity 72% and 94% for MIBG, and 88% and 89% for DAT scans.30 In a comparison with brain perfusion SPECT in DLB subjects alone, sensitivity was the same for both at 79% and better than brain perfusion SPECT (53%).31 None of the comparison studies were verified with postmortem confirmation of the diagnosis. A comparison of coronal T1 MRI scans showing relative atrophy within the hippocampus/temporal lobe in an AD subject (left) compared with a DLB subject (right). Images were provided by Elijah Mak (University of Cambridge, UK). AD, Alzheimer’s dementia; DLB, dementia with Lewy bodies. Hence, structural MRI is a useful means of assessing for AD pathology, and in a patient presenting with clinical symptoms of DLB, medial temporal atrophy or global atrophy on MRI is likely to indicate a mixed AD/DLB picture. In addition, bilateral atrophy in the amygdala is a specific marker of DLB. Nevertheless, an MRI with minimal atrophy would also be consistent with DLB pathology, with little or no coexisting AD pathology. FDG PET is an in vivo marker of metabolism that uses a radioactive analogue of glucose to show areas of hypometabolism consistent with dementia, with the pattern of such areas used to identify the underlying diagnosis. In summary, there is good evidence for occipital hypometabolism as a marker of Lewy body pathology in patients with dementia. However, studies have been small and the sensitivity and specificity inconsistent, meaning that the accuracy of this finding is unclear. PET ligands can now identify amyloid β burden in vivo, but assessing the presence of amyloid β is unlikely to accurately differentiate DLB from AD. Indeed, a recent review of amyloid PET imaging found Lewy body disorders had lower cortical amyloid β than AD but that there was a subset of patients who had elevated levels compared with controls. However, as there was such a large variation, this limits the use of these scans in the diagnosis of DLB.47 Furthermore, with the recent introduction of in vivo tau PET imaging, which has been found to correlate well with postmortem neurofibrillary tangles,48 the utility of amyloid β imaging even in the diagnosis of AD is likely to diminish. Newer techniques involving algorithmic learning of imaging modalities using artificial intelligence have the potential to allow clinicians to apply neuroimaging research at an individual level. Alzheimer’s disease has seen the most extensive research, with support vector machines able to differentiate AD subjects from controls using MRI with an accuracy of between 71% and 100%. Machine learning could also be used to predict both conversion of prodromal symptoms to fully fledged disease and potential responses to treatment.49 50 This is a rapidly evolving field; however, studies in DLB are still awaited. The evidence base for the use of imaging markers in DLB is still small, especially when compared with AD, with few large studies evaluating the accuracy of imaging biomarkers in pathologically confirmed DLB. Nevertheless, DAT imaging has been shown in two studies to be more specific than clinical diagnostic criteria for DLB and should be the imaging modality of choice in differentiating DLB from pure AD. The evidence for MIBG imaging continues to build but is hampered by the lack of postmortem verification in studies to date and the relatively select nature of the population studies, largely cohorts from Asia with significant vascular disease. There are signs, however, that it is useful in the differentiation of Lewy body disorders from vascular parkinsonism and non-Lewy body parkinsonian disorders. Structural MRI is useful for the identification of Alzheimer’s type pathology in dementia patients; however, their utility in the diagnosis of DLB is made difficult by the generally lower rates of atrophy seen in DLB, with only bilateral amygdala atrophy the consistent finding. Occipital hypometabolism on FDG PET and occipital hypoperfusion on perfusion SPECT has been found in patients with DLB but only in small sample sizes. We would like to thank our colleagues for providing the following images: MIBG: Joseph Kane (Newcastle University, UK), Alan Thomas (Newcastle University, UK) and Jim Lloyd (Royal Victoria Infirmary, Newcastle upon Tyne, UK); DAT scans: Sean Colloby (Newcastle University, UK); and MRI: Elijah Mak (University of Cambridge, UK).
. F-FDG-PET for the early diagnosis of Alzheimer’s disease dementia and other dementias in people with mild cognitive impairment (MCI) (Review). Cochrane Database Syst Rev 2015:1–104. Funding National Institute for Health Research (NIHR) Cambridge Dementia Biomedical Research Centre based at the Cambridge Biomedical Campus has supported the writing of the paper but did not have a role in the decision to submit for publication or the design of the review.